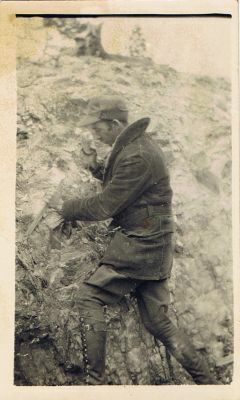 ronsden.com - Old family photos/Dad the rockhound. I'm really not sure where this was taken. I want to say the RKO Ranch, although the rock outcropping looks out of place for this location. He seems to be wearing military clothing (at least boots and pants). The clothing may be left overs from WW I when he was in the Calvary, albeit a cook.